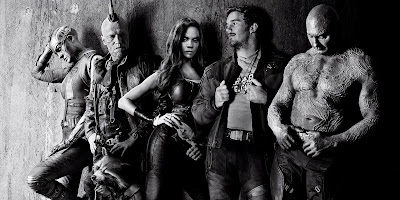 Back in 2014 Guardians of the Galaxy was an unexpected hit after being widely tipped to be the first Marvel movie to bomb. Cathy and I both loved it (it was my film of the year) and we have subsequently got into GotG in a big way. Toys, books, comics, and playing the Awesome Mix soundtrack album quite a bit. I've blogged about how I found one storyline from the comics particularly inspiring. There was also a possible religious-themed social commentary in the first film - it's no accident the villain is a religious fanatic. A few weeks ago Guardians of the Galaxy Vol.2 came out. I was a bit worried whether it would be anywhere near as good as the first one. But I also had high hopes. I wasn't disappointed. The film was brilliant. But what I got was something much deeper than I expected. It is probably the movie that has asked the most interesting theological questions for a long time. Spoilers follow, so don't read on if you don't want any. The first film ends on a slight cliff-hanger. Peter Quill (Star-Lord) is told he is half human, and half something else. Yondu tells a subordinate that he's glad he didn't deliver Quill to his father. This film is about Star-Lord and his dad. Star-Lord is told he is most likely immortal, what with being the son of a god with a small g. And then Ego reveals his intentions. His billions of years of consciousness have convinced him that other life forms are mundane and disappointing and he intends to wipe them out, transforming the matter of the universe into his own self. Presumably to become a God with a BIG G.
Ego offers Star-Lord the opportunity to join him in transforming the universe into God but first Star-Lord has a question about his mother. Did Ego really love her? Yes, Ego replied, but his mission to change the universe was more important. Then Ego drops a bombshell, saying he gave Meredith Quill the brain tumour that killed her. Star-Lord doesn't ask any more questions, he just draws his guns and begins blasting away at the Kurt Russell-shaped embodiment of Ego. Star-Lord and the Guardians then fight Ego, first to escape, and then to kill him. As I said this is the most theologically interesting movie plot I've seen in a while. You could almost say it's an anti-theistic plot, in that it shows attacking a god (with a small g) as an heroic act. The Guardians get to save the galaxy for a second time. It's rare that a movie depicts deicide - the act of killing a god. Of course this isn't the 'god' of any established religion, this is a 'god' in a fictional setting, but it still opens up those questions. Like many people who have been involved in a church a long time, I have prayed for people to be healed, who then haven't been healed. Just over 10 years ago a brilliant Christian man I knew died of cancer at the age of 32, a few months after diagnosis. This was despite regular prayer meetings, including at the Christian charity I worked at, asking for him to be healed. My experience is not unique. Prayers for healing often go unanswered. I don't think it's an accidental music choice that when the Guardians arrive on Ego's planet, the song playing is George Harrison's 'My Sweet Lord' with it's refrain "I really want to see you, Lord." This is something prayed in earnest by many believers when praying for God to intervene in a situation. If God doesn't intervene, Christians console themselves with reassuring statements that God's ways are higher, or there must be a plan behind it all, or, the line I hate most, that God takes the best ones first. (What does it say about those who don't die young?) Sometimes it's said that by dying, people are "really healed" as in made perfect in the afterlife. But that wasn't what was prayed for. When I have prayed for people I wanted them restored to full health in this life. And then sometimes people say that God will have all the answers when we see him after we die. That feels a bit 'too little too late' to me. Guardians of the Galaxy Vol.2 actually gives its main hero the opportunity to ask those questions without having to die first. If Ego is so powerful why couldn't he save Star-Lord's mother? The answer is so callous and cruel - not only did Ego not prevent it, he actively caused it - that Star-Lord forgets all about the promise of his own immortality and proceeds to attack the being who fathered him. If we did get answers to our questions and we didn't like them what would our reaction be? Would we suddenly turn on God like Star-Lord? That's a big question. All the assumptions are that when we get answers we will be satisfied by them, but what if we are not? I discussed this with Paul Hammond, presenter of the morning show on UCB Radio last week and Paul asked whether comic book movies are the right place for these kind of theological topics to be explored. It was a question that surprised me a bit, but as I thought about it I realised that they are possibly the only movies left where they can be asked. There is a layer of cynicism running through most 'realistic' cinema these days so perhaps to discuss questions of belief you first have to get the audience to suspend disbelief. If you've accepted spaceships and pink slimy monsters and genetic experiments that look like talking raccoons, it's not a stretch to consider interacting with a divine being - even if it only a god with a small g.